Nearly all were satisfied with the extremely comfortable feel the shoe provided. “Clean”, “futuristic”, “unique” and “cool” were words commonly used by purchasers of this product to describe its silhouette. The Nike Zoom Mercurial Flyknit can be worn for long hours without any problems, several users revealed. Some thought this shoe was lightweight, breathable and offers good traction. The sneaker’s sole provided significant cushioning, thus offering plush comfort underfoot, noticed by a few buyers. One consumer liked the premium material used on the leather heel. The material used on this shoe’s upper was super flexible, most confirmed. The Zoom Mercurial Flyknit fits consumers with narrow as well as wide feet, some advised. It was comfortable out of the box, a good deal of users disclosed. Many stated that this casual sneaker fits true to size. Those who bought the white colorway confirmed that the shoe got dirty easily and was hard to clean. Others thought this sneaker felt extremely tight around the ankle. 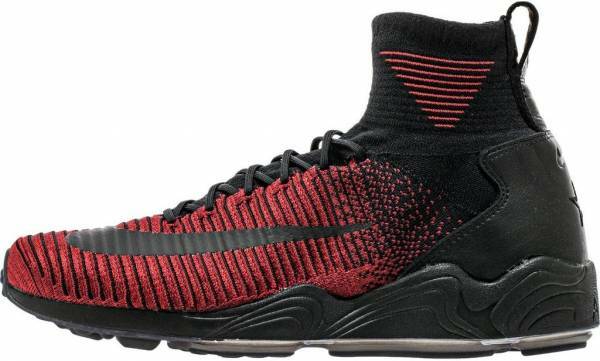 The heel of the Nike Zoom Mercurial Flyknit looked clunky, one reviewer observed. The shoe’s upper lacked support, another user advised. A few mentioned that this sneaker is not the type that can be worn every day given its high-cut design. This casual shoe is sold at an expensive price point. Unconventional and odd-looking, the Nike Zoom Mercurial Flyknit is definitely an acquired taste. Folks who are unaware of its history and value may, at first glance, dislike this shoe. Sneaker collectors and those who fancy the unique and eccentric, on the other hand, would instantly perceive it as a fashionable piece. However, it can only be enjoyed by a few as it is expensive and released in limited quantities. Lucky are the ones who were able to acquire a pair for they can enjoy the plush comfort it provides. Back in the year 2014, the famous trio Hiroshi Fujiwara, Tinker Hatfield and Mark Parker, popularly known as HTM, teamed up to transform the Nike Mercurial Superfly, a revolutionary soccer shoe created in the year 2009, into a piece of art worthy to be strutted off the field and in the city streets. This groundbreaking silhouette, dubbed as the Free Mercurial Superfly, featured a Flyknit upper, a Dynamic Fit collar, Flywire cables and the Nike Free 5.0 outsole. Packed with tech, this creation not only boasts of performance but also of street-ready, fashion-forward aesthetics. Another timeless classic known to many Nike running fanatics is the Air Zoom Spiridon. Introduced in the year 1997, this sneaker caught the attention of both runners and the general public for its distinctive outsole that featured the iconic Zoom Air tech. It was also acclaimed for its style and comfort. Fusing two existing products to come up with an innovative creation is a common practice for global footwear brands and Nike is not an exception. Unafraid to take risks, the brand decided to mix the silhouette of a classic model, the Air Zoom Spiridon, with a recent creation, the Free Mercurial Flyknit. The outcome, a stunning hybrid in the form of the Nike Zoom Mercurial Flyknit. This soccer/running-inspired silhouette made its first appearance in Paris during an exhibition held to celebrate “Soccer, Speed and Innovation”. This Nike event was called the Palais of Speed and it was held in June 2016. Only nine pairs were released during the event. However, on June 23. 2016, the Zoom Mercurial Flyknit was made available to the public. To some, this high-rise sneaker may look weird and unusual. However, there are those who are impressed with this shoe’s design stating that it looks modern and stylish. The ones who do find it attractive has proven that this piece of footwear is truly eye-catching. Available in neutral-tones and vibrant hues, monochromatic and multi-colored, the Nike Zoom Mercurial Flyknit pairs well with cuffed pants and joggers. To top it off, this shoe, made of flexible and breathable Flyknit is capable of keeping your feet cool in scorching hot weather. Its Zoom Air sole also ensures to keep your feet comfy all day. Soccer and running shoe inspired and crafted with a Flyknit upper that molds to the wearer's feet, count on this shoe to offer adaptive fit and plenty of toe room. Support offered is, however, minimal due to the upper’s stretchy material. Commonly running true to length, this shoe is available in men’s sizes 6-13. The Nike Zoom Mercurial Flyknit truly stands out for its radically-designed upper made of exposed Flyknit that shifts colors with every movement, not to mention its high-cut collar that improves the shoe’s fit. The Zoom Air sole unit, composed of a compression molded Phylon midsole and modified rubber outsole, is also visually-appealing. It offers lightweight cushioning as well as enhanced durability. The leather pull tab is added for easy slip on and off. Leather heel cap improves the shoe’s support. Lockdown fit can be achieved with the help of the lacing system. The Nike Zoom Mercurial Flyknit’s insoles are removable. A large fused “Swoosh” can be seen on the shoe’s lateral side. A small “Swoosh” can be located on its heel. Other noticeable features are the "Air" callout engraved on the heel and the "Zoom Air" wordmark found on the shoe's undersole. The white colorway comes with extra gray laces.